There is a lot of different kinds of cookware out there and sometimes it can be difficult to choose. Of course, a couple of the more noticeable names out there are Gotham Steel and Red Copper, both of which get a good reputation with customers. But the question I want to ask is which is better, and which one will suit you and your needs better. I have used both sets of cookware for 2 months each to get the best idea of their quality and durability. First of I will talk about Red Copper pans and what I think of them and then following Gotham Steel and then after I will give a direct comparison between the two. Firstly, let me start of by talking about their design. Their base is made primarily from copper and their handle is riveted and made from a stainless steel. While the main body of the cookware is made from cooper the bottom which is in contact with the stove is actually made from stainless steel. This makes the pans heat up more quickly and helps them maintain and keep a constant even heat through. They are painted red as their name suggests. While their look may not to be everyone tastes they do have a unique bright style with their red coloring. Their handle is made from a separate material than the base this helps a lot which keeping the handle much cooler and easy to hold even when the stove is on high temperature. The rivets make holding these pots and pans more comfortable and generally more practical as well which is a nice design choice. As far as their weight goes I would say that they have a nice strong and sturdy build quality but still remain relatively light. I mean they aren’t very lightweight but compared most cookware they are somewhat lighter. So, for me personally they have a nice medium that offers both good build quality without being heavy. As you would expect the Red Copper pans are coated with a non-stick substance which is designed to stop food from sticking. It does an amazing job with this, after using them about 3 days daily for 2 months I only had a couple of occasions where I noticed any sticking and that was more because I had the stove up too high and the food started to burn. Though generally the copper and the non-stick they have used work extremely well. Though I would like to mention in my usage I did notice a couple of marks and such starting to show after a couple of months of usage. Also the paint on the outside is also prone to marking. As you rarely have any issues with food sticking cleaning this cookware is a breeze. All you need is a little warm water and soap and it’s like new in seconds! I personally do really like the design and style of the Gotham Steel cookware. They look quite modern and contemporary and would work with basically any kitchen. Gotham copper cookware is said to be totally nonstick. Meaning no butter or oil needed to cook with at all. In my own usage while the do a cook job they definitely are not perfect. When I compare these pots and pans to most generic cookware sets they are much better. But the food can stick, and it does with these pans but that’s only if you don’t use oil which I think is rare for most people. Though if you are buying these with that intention to cook with them without oil they definitely will stick somewhat and aren’t up to par when compared with Red Copper cookware in that regard. One thing I was really impressed with these pans was how quickly they heat up and maintain the heat so well. Also, you likely won’t need to turn your stove up high when you are cooking with them because of how well the heat is transferred through, so keep that in mind. As far as cleaning these well they are quite easy to clean. I just use a cloth and a little soap and water, and they will always take of all the grease and grim that may have built up from cooking. Though try to avoid using a scrubber or something as this can damage it. Another thing I was really impressed with was how sturdy and heavy duty these pans feel while remaining really lightweight thanks to being made primarily out of aluminum. Design – Both sets of cookware have a unique design and style. Both sets of cookware are study yet lightweight though the Gotham Steel are definitely a little lighter in comparison. Cooking – Both sets of cookware can be used for a host of cooking needs on the stove and both can be even used in the oven. Both handles remain cool enough to handle even when the heat is up high as well. When you are using the Gotham Steel though you should be primarily using a lower heat as the metal heats up quicker than the Red Copper and they also hold the heat better as well. Cleaning – Each set of cookware was easy to clean up with. Though I did notice some chips and marks on the Red Copper starting to show on the outside primarily after 2 months of usage. Non–Stick – Both have been marketed as being non-stick and both do an amazing job when you are using oil or butter. Though with the Gotham Steel it seems to be more prone to sticking when there is no oil being used when compared with the Red Copper which basically never sticks even without oil. Weight – Both sets are lighter than the cookware that I am used to using which is nice. Gotham Steel is lighter than the Red Copper though both options don’t feel overly heavy or hard to lift even when full. 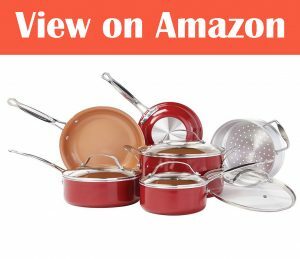 Price – When comparing the prices between the 2 options this isn’t a noticeable difference with both offering a similar price point of around $100 for a 10-piece set of cookware. 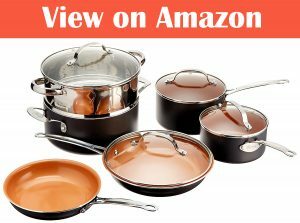 Both sets of cookware offer a high quality for a good price point and are quite evenly matched. If you are the type of cook who cooks with oil or steams their food I would recommend Gotham Steel. They seem to be a little more durable and lightweight when compared with Red Copper. Though if you are the type of cook who doesn’t like to cook with oil then the Red Copper are probably your best bet thanks to having a more effective non-stick than the Gotham Steel and rarely ever got stuck even when I wasn’t using oil or butter. Though overall both sets of cookware are great, and I can easily recommend both.